Four Stages of Competence | Dr. Z. Working on curricular design the last few months, I’ve been reading a lot of educational theory. Since it’s a literature that’s new to me, I find myself newly impressed by some old concepts. One of these is the “conscious competence” learning model. Developed in the 1970s by Noel Burch (though the roots are probably earlier), the model describes four stages on the way to competence in a new skill. There’s more to theological education than competencies – like intellect, heart, and character – but we’re also teaching skills. And these four stages, developed in a secular context, prove helpful in thinking about the skills developed in theological education, especially understanding and communicating Scripture. The student doesn’t know how to do something, but doesn’t recognize that he doesn’t know it. Maybe he’s never heard of biblical exegesis. Maybe he thinks exegesis is busywork and unnecessary for real life and ministry. Or maybe he wrongly believes he already knows how to do exegesis, when in fact he doesn’t. Before he can move to the next stage, he needs to recognize his incompetence and the value of the new skill. The student still doesn’t know how to do something, but he does recognize the deficit and the value of the new skill in addressing the deficit. So even though he doesn’t know how to do exegesis, he’s come to see it as an essential skill for ministry, a skill he currently lacks, so is motivated to advance his knowledge and make the kind of mistakes one needs to learn. The student understands or knows how to do something, but with concentration. To do exegesis, he has been taught a series of steps, and he is able to carefully follow them, often checking the list to make sure all the steps have been handled. Much of his thinking along the way is about the process he needs to follow. The student has had so much practice with the skill that it has become second nature. As he approaches a text, exegesis comes about naturally. He moves through the process without thinking about it, and intuitively adapts the steps as needed according to the needs of his situation and the text itself. He is in a position start teaching others. Like many great theories (sorry, Isaac Newton), Burch’s model is basically pointing out the obvious. But it brings a perspective that I’ve found helpful in planning individual courses and the theological curricula as a whole. Most of what we do as theological educators takes place in the middle of this paradigm. But we need to expand our educational horizons to encompass both extremes. Looking just at the first stage, here’s one application for theological education: we need to educate about education. Most people in the church, even aspiring leaders, are not sitting there with a clear perspective on what skills they need to do ministry well. 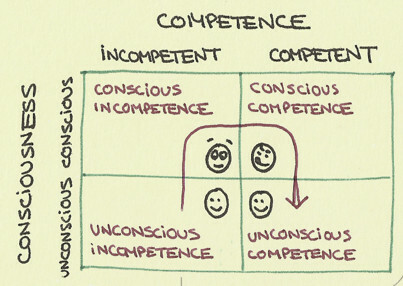 Many prospective students are currently in the state of unconscious incompetence (stage 1). This means that “give them what they want” and “if you build it they will come” approaches both fail. If we give students what they want before they desire the right kind of tools, they may show up but we’re not equipping them well. But if we just design an amazing curriculum and hope students show up, they may not because they haven’t come to understand their need for what we’re offering. So churches and seminaries both need the vision to educate their people about education. From a church perspective, this involves not just doing ministry but letting people know why we do ministry the way we do it, not just preaching our conclusions but letting them know how we are handling the Bible and why we handle it and the importance of the hard work of study. We need healthy churches that foster in people appetite for healthy ministry and awareness of what that involves. For those who would be trained to lead, this would mean getting to stage 2 in the pew. From a seminary perspective, we need to find ways to communicate to the wider Christian community what is in our curriculum and why. Rather than assuming the value of each subject is self-evident, we need to help prospective students see how the curriculum fits together and how it collectively is building them toward where they need to be for faithful ministry. We can’t assume we’re talking to people at stage 2. Realizing many are at stage 1 will help us be ready to shepherd those who are thinking about theological education to delight in the right kind of theological education. This competency framework provokes further thoughts about theological education that I’ll take up another day, but you can see how looking at a training model through this paradigm can catalyze helpful ideas for the seminary and for the church. Pingback: Another Perspective on Competence: The Dreyfus Model | Dr. Z.